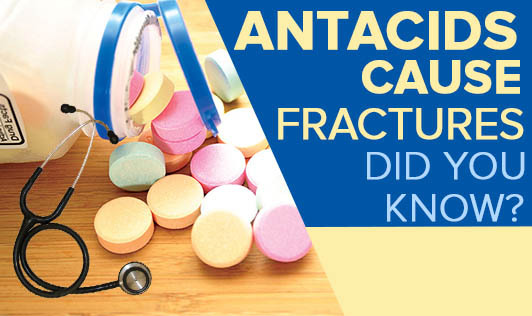 Antacids cause fractures. Did you know? According to the food and drug administration, prolonged use of certain drugs taken for heart burn, acid reflux or ulcers cause hip, wrist and spine fractures. These drugs work by reducing the amount of acid in the stomach and belong to a group of medication called proton pump inhibitors (PPI). They are available as both prescription and over the counter medication used for gastroesophageal reflux disease (GERD), ulcers in the stomach and inflammation of the esophagus small intestine. Some of the PPI's present is Nexiu, Dexilant, Prilosec, Zegerid, Prevacid, Protonix, Aciphex and Vimovo. Some of the PPI's present in over the counter medication are Prilosec OTC (omeprazole), Zegerid OTC (omeprazole), and Prevacid 24HR (lansoprazole). Unless your health expert prescribes for PPI's, do not use it. Be aware of the adverse effects of PPI's. People who have received high dosage of PPI's regularly for 1-1.5years have an increased risk of hip, wrist and spine fractures. While administering over the counter medication, read the drug facts label carefully. An over the counter PPI can be used for 14 days only for a heart burn. Continuing the medication should be only after a consultation with your health expert which is absolutely necessary. Not more than three 14-day courses can be administered in a year.